This 23-year-old woman from Chesapeake came to our office because she has been bothered all of her life with breast asymmetry. 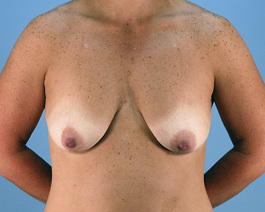 The left breast is larger and therefore, has considerably more sag. Placing breast implants alone cannot give her the result she desires because of the asymmetric sag that would persist. To correct the severe asymmetry, I felt her best result would be a breast lift with removal of breast tissue from the larger side, followed by another surgery to place breast implants. Because the patient was moving out of the area, she felt strongly about attempting the correction with one procedure. 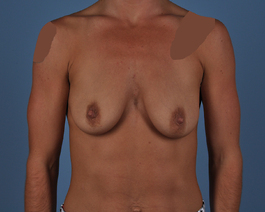 With careful planning, we proceeded with a vertical breast lift, removing more tissue on the left side. A total of 162 grams was removed on the left side and 12 grams removed on the right. Further improvement of the asymmetry was accomplished with two different diameter breast implants, placing 390cc in a narrower implant on the right and 360cc on the left. Also factored into the surgical planning was the fact that her ribs are more prominent on the right. Clearly, this type of European vertical breast lift is a significant advancement in breast surgery. It allows the surgeon infinite choices in the amount and location of breast tissue removal for better symmetry and shape. The after photos show significant improvement, although her scars will likely improve since these photos were taken just 2 months after surgery due to the relocation of the patient. This case is a great example of the care that must be taken and the expertise that must be applied to customize each procedure to the individual patient.